Prairie Dock doesn’t typically suffer much insect predation, so a clump of brown leaves in the Prairie Dock patch easily caught my attention. 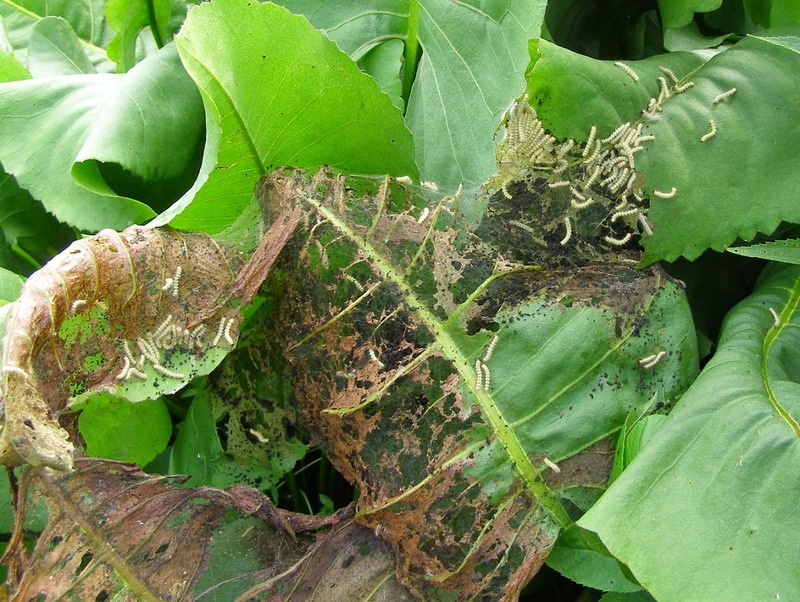 I arrived at the affected plants to find a hoard of Fall Webworms consuming the thick, leathery leaves. I’m used to seeing Fall Webworms at Blue Jay Barrens, but they have always been on trees or shrubs. There don’t seem to be many tree species that they won’t eat, so I guess it’s not unlikely that there are many plants they would find palatable. If that’s where the female laid her eggs, the larvae really don’t have much choice other than eat or die. 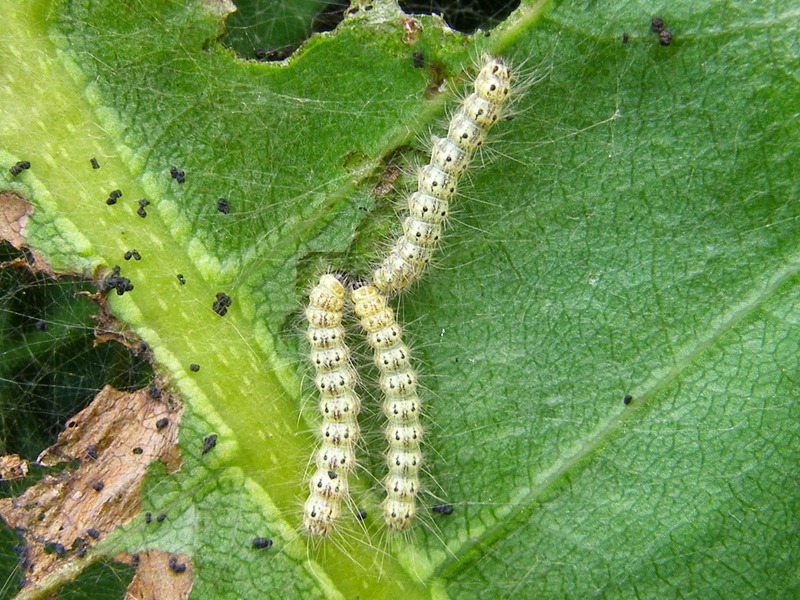 Fall Webworms are communal feeders that build a network of webbing that covers their feeding area. 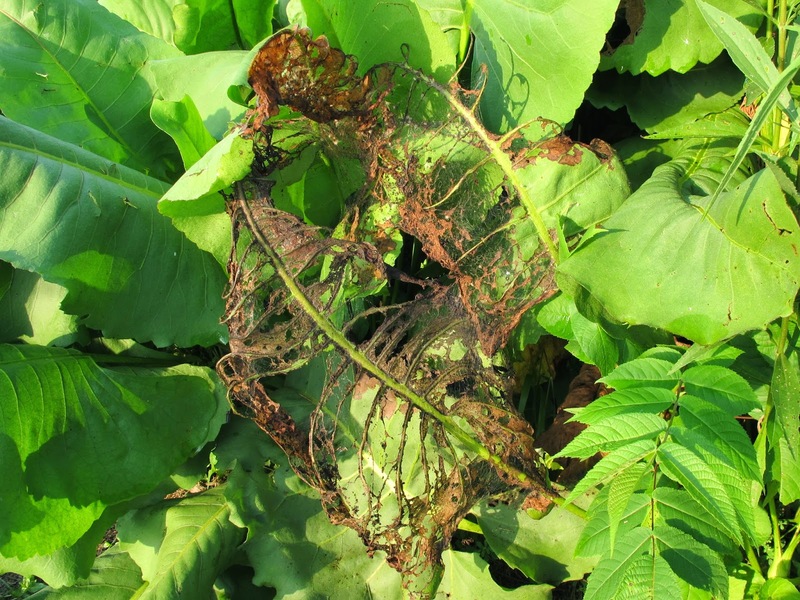 New silk strands have been stretched over the midrib of the dock leaf to offer protection to those caterpillars heading out to begin feeding on a new section of leaf. I think this is the webworm equivalent of painting yourself into a corner. It won’t take long to eat this small edge piece. 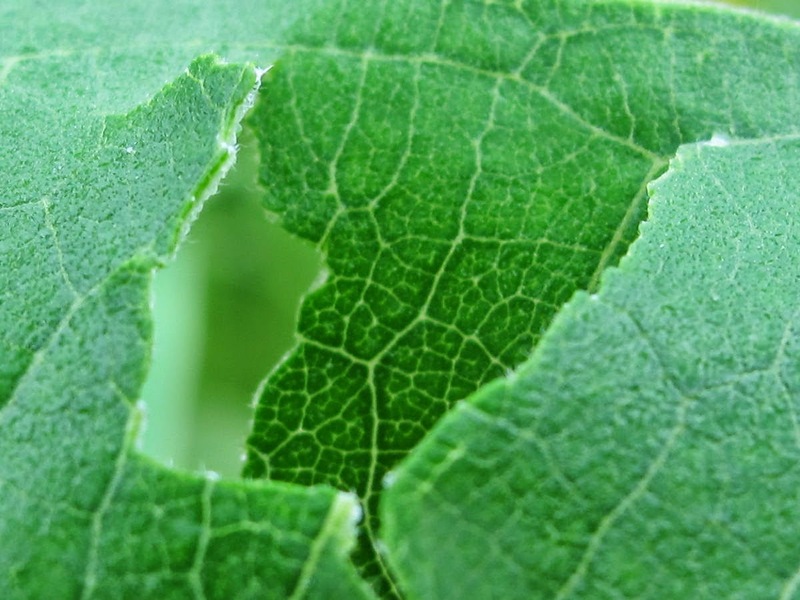 Then it will be a long trek to the other side of the leaf to find some more green. 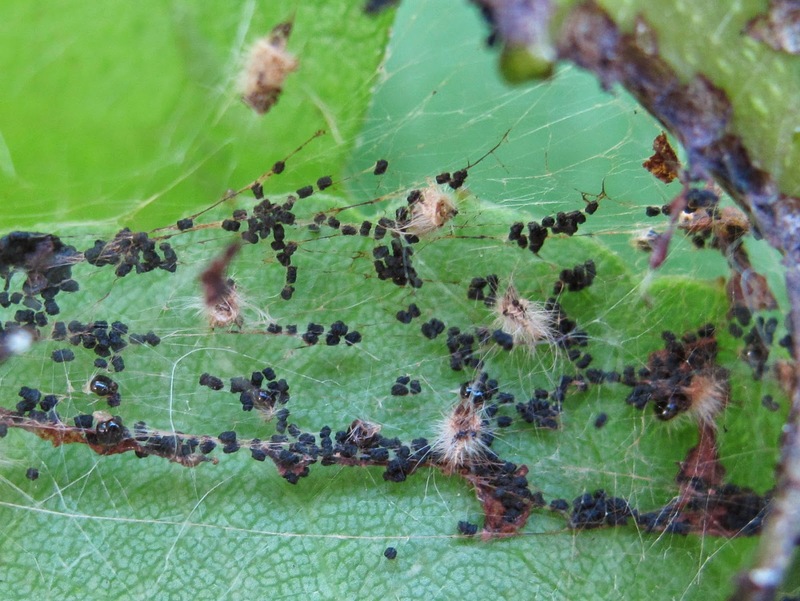 As the name suggests, Fall Webworms are normally encountered towards the end of summer. 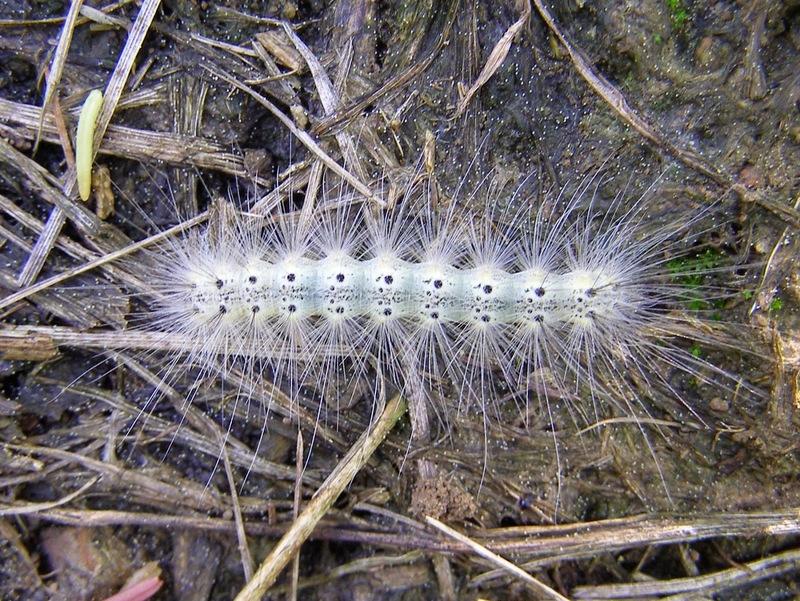 In Ohio, this species can produce two generations in a summer, especially if warm temperatures arrive early in the year and hasten the spring emergence of the adult moths. This year we seemed to shift from winter directly into summer, with little transition. Snow fell on April 15 and that was the last time we had any freeze or frost. By April’s end the temperatures were in the seventies. Any species whose development was triggered by temperature was quick to emerge. 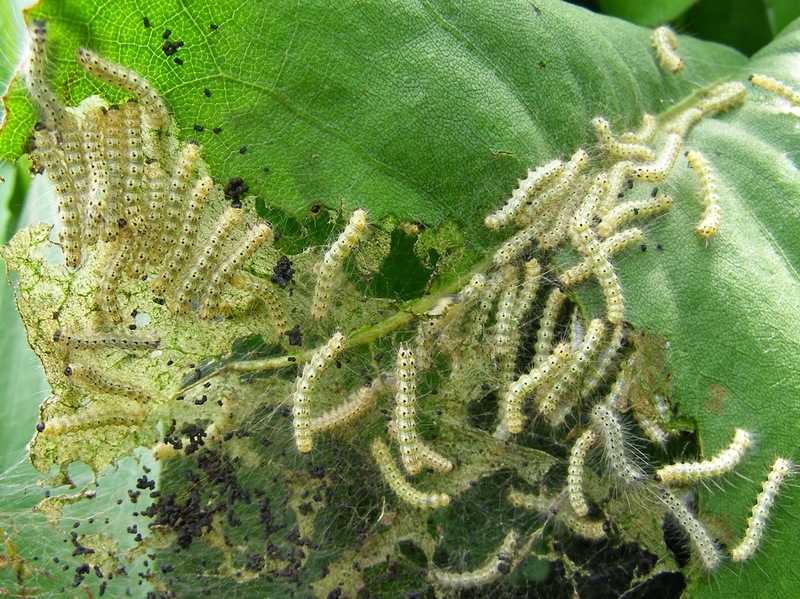 Several of the webworms didn’t remain within the community. Bunching together is supposed to afford some measure of protection from predators. Maybe predators are more attracted to the mass of potential prey items and fail to recognize these lone individuals. When I checked back a couple of days later, the webworms were gone. I looked around, but couldn’t find them anywhere nearby. All they left behind were shed skins and frass caught in the old webbing. 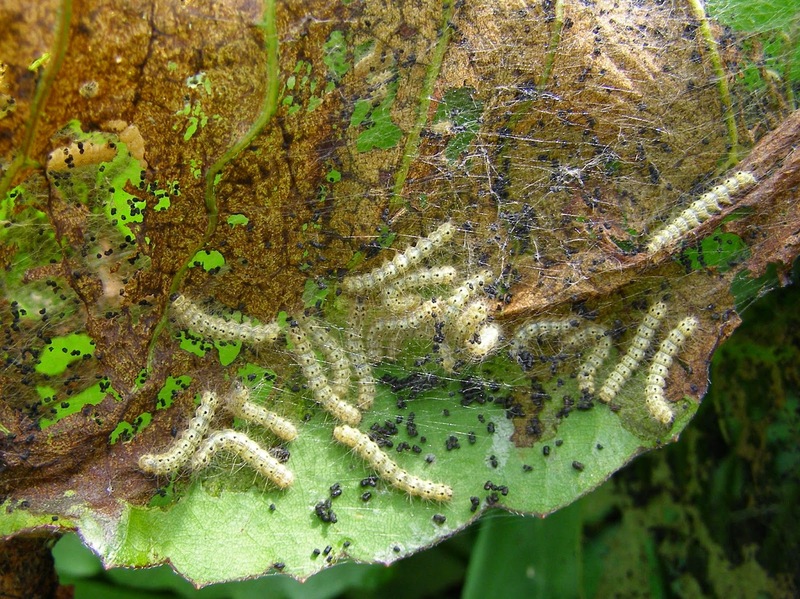 Fall Webworms typically leave the webs and go to the ground to pupate, but I wouldn’t think they would do that immediately after casting off their old skins. The following day I found several individual webworms. These were all the next size up, a little larger and hairier than what I had seen on the Prairie Dock. Some were on the ground and others were munching on various plant leaves. Perhaps there is some type of dispersal that takes place prior to pupation, so the pupae aren’t all confined to the same small area. I’ll have to pay attention when more of these guys show up later in the summer. Maybe I’ll learn whether or not this is typical behavior for the species. 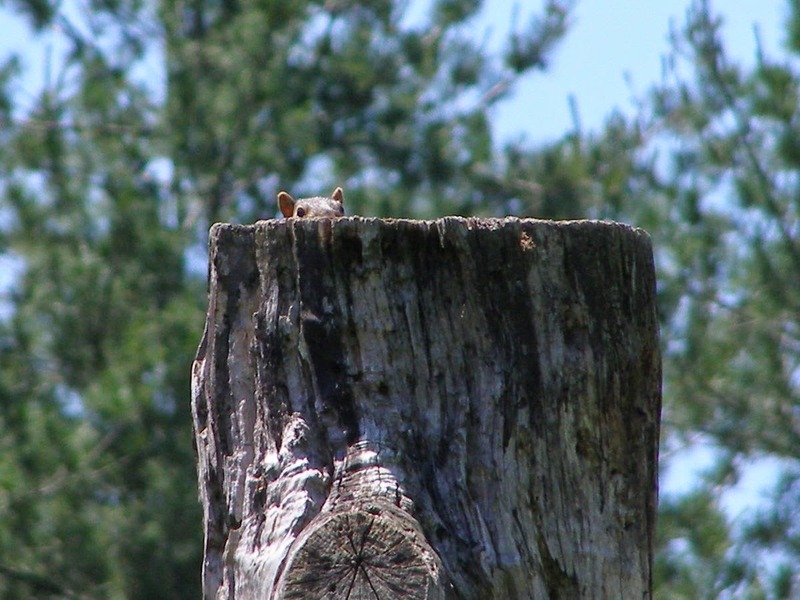 Squirrels have always been a common yard mammal at Blue Jay Barrens. 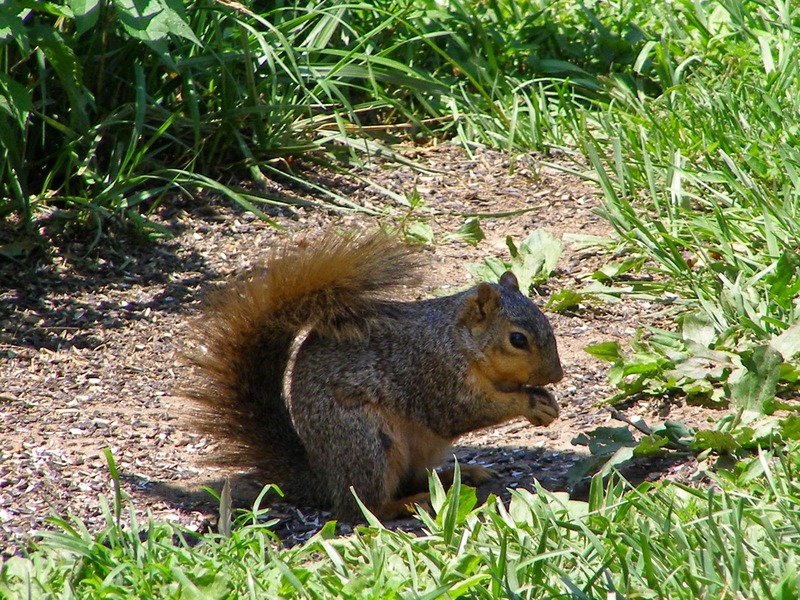 Gray Squirrels normally dominate, but during the past year, Fox Squirrels have risen to be masters of the open spaces. 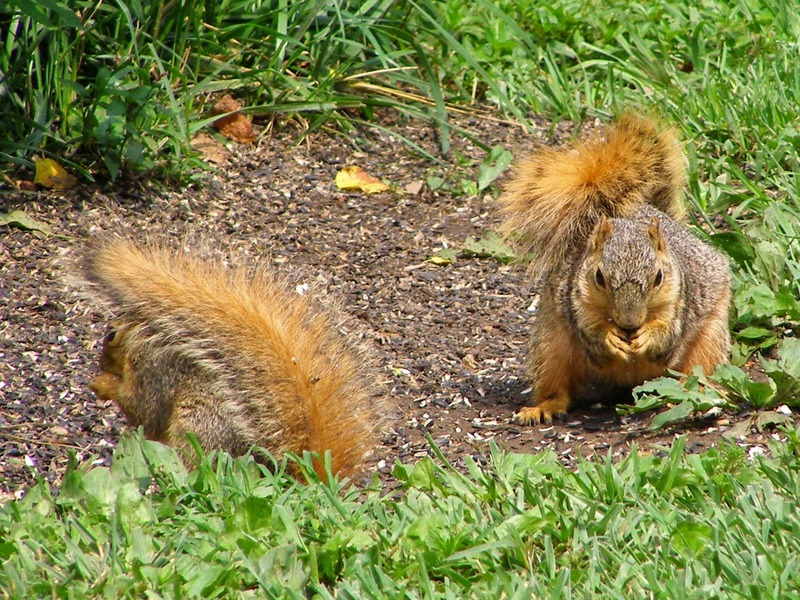 The Fox Squirrel, shown at left in the photo above, is a slightly larger version of the well known Gray Squirrel. The most noticeable difference is in the coloration. 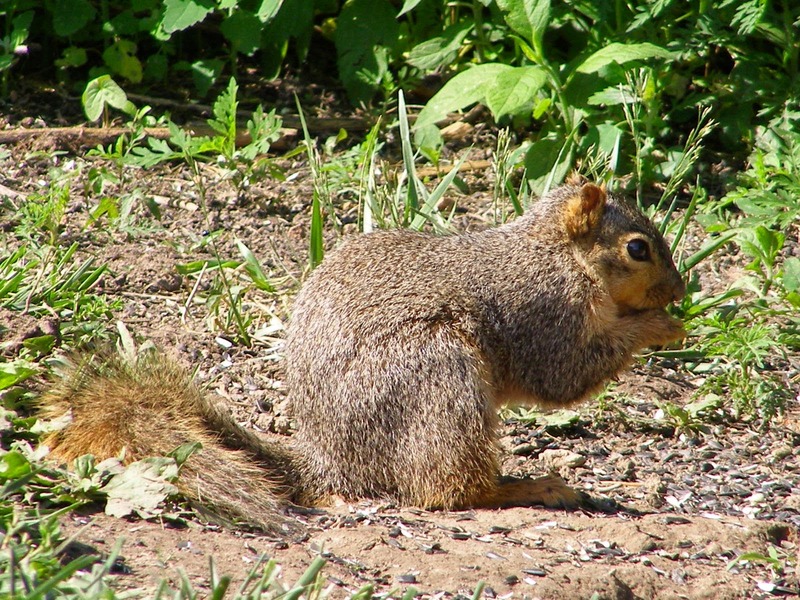 Fox Squirrels display an abundance of rusty red colored hair on the face, legs, belly and especially on the tail. 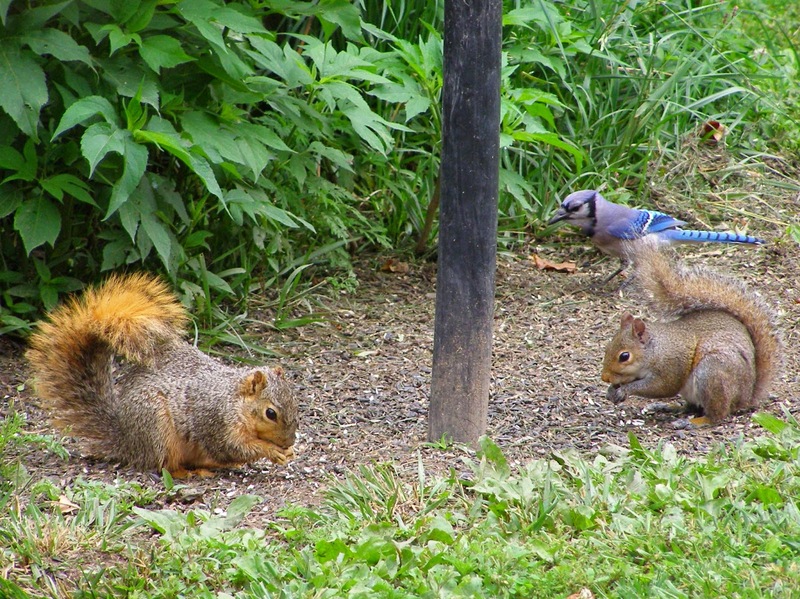 Both species have similar dietary preferences, so are often attracted to backyard feeders. 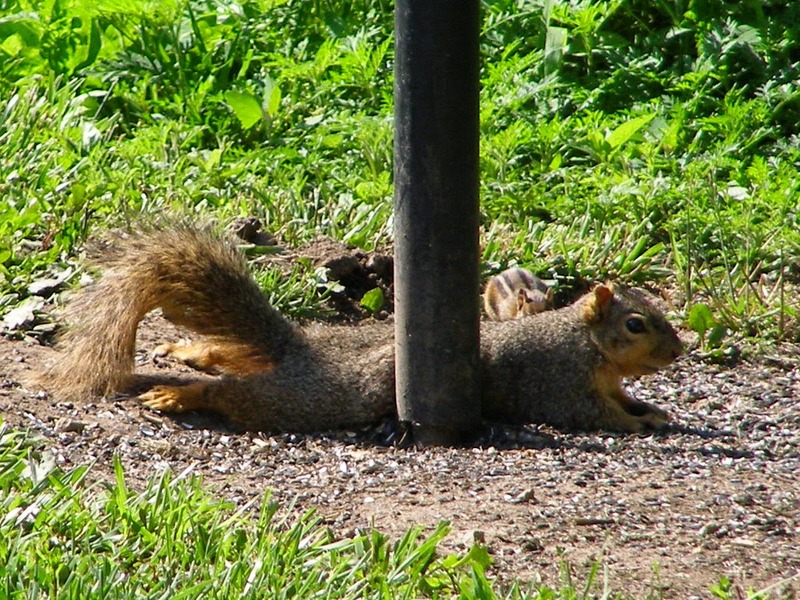 Fox Squirrels prefer a more open habitat than do the Gray Squirrels. They will often leave the shelter of a tree to forage far out into an open field. They are also not as ambitious as the Gray Squirrel when it comes to accessing a food source. 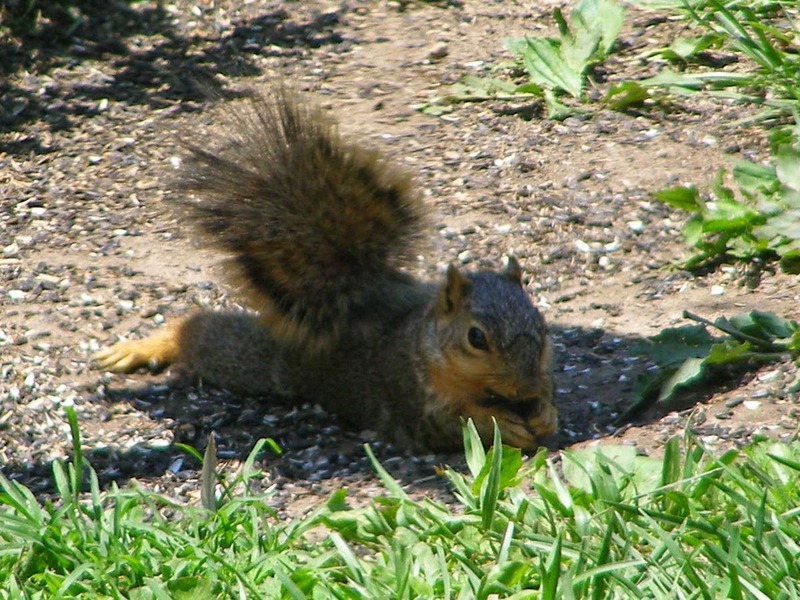 While a Gray Squirrel will make every effort to reach a feeder full of delectable food items, the Fox Squirrel is content to stay on the ground and take whatever comes its way. 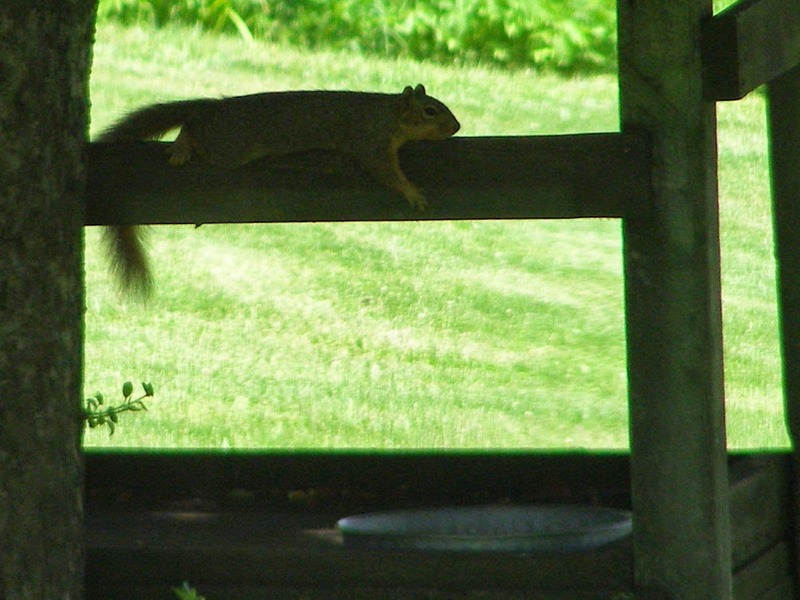 In fact, Fox Squirrels often appear to be downright lazy. Why bother holding up your body when you can stretch out and take it easy? A prone position certainly keeps the food close to the mouth. When the temperature begins to rise, take advantage of any available cooling shade. The feeder casts a perfect squirrel sized shadow. With a little care you can stretch out and still avoid the heat. On a really hot afternoon, a nice shady perch above the water pan may be a prime location. When the air begins to cool in the evening, it’s time to retire to the cavity exposed at the top of the dead tree stump. 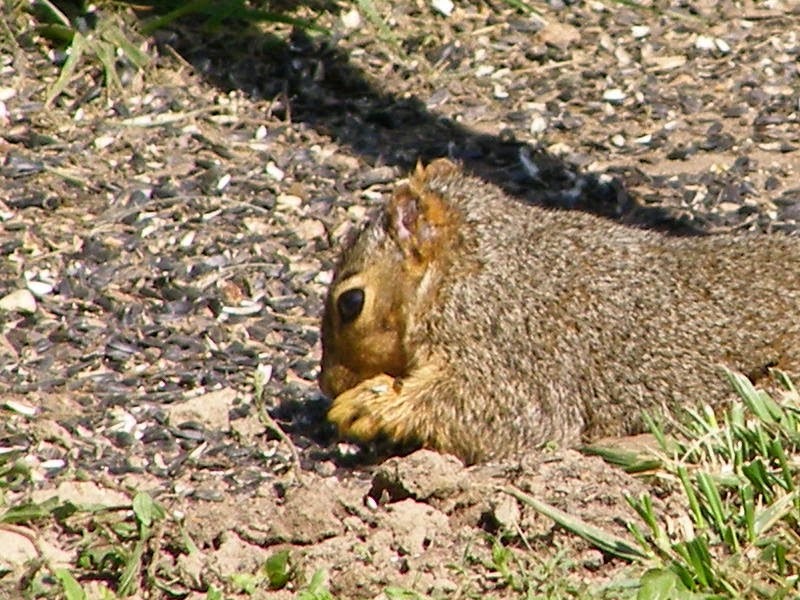 The Fox Squirrel is an excellent example of how to avoid the ill effects of a hot summer day. The size of mammal populations is always changing. It’s best to enjoy those animals that suddenly appear in abundance. You never know how long they are going to stay or what may one day take their place. Two years ago I encountered this medium sized shrub in an odd corner near the road. I couldn’t identify it at the time, even though there was something strangely familiar about its appearance. I left it in place in hopes that it would someday produce flowers that would allow me to follow through with an identification. That finally happened this year. 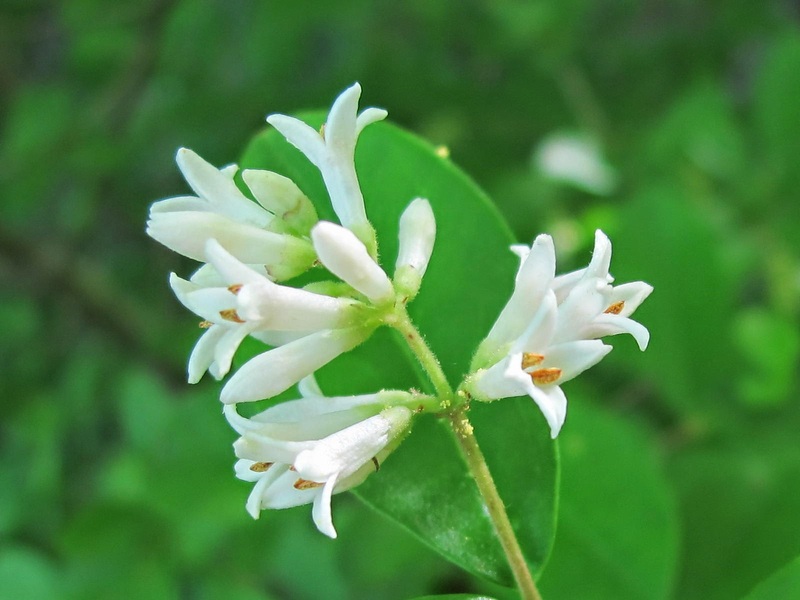 These white flowers are produced by the Privet, Ligustrum vulgare, a common landscape species that can easily escape into the wild. Outside of the garden setting, this non-native plant becomes invasive. I think it most likely that the original seed for this particular specimen was brought to Blue Jay Barrens by a bird that had dined on the fruit. Since the plant became established near the roadside, it is also possible that fruit or seed traveled by car or truck and disembarked here as the vehicle passed on the road. As soon as I saw the plant name it occurred to me why the plant seemed so familiar. 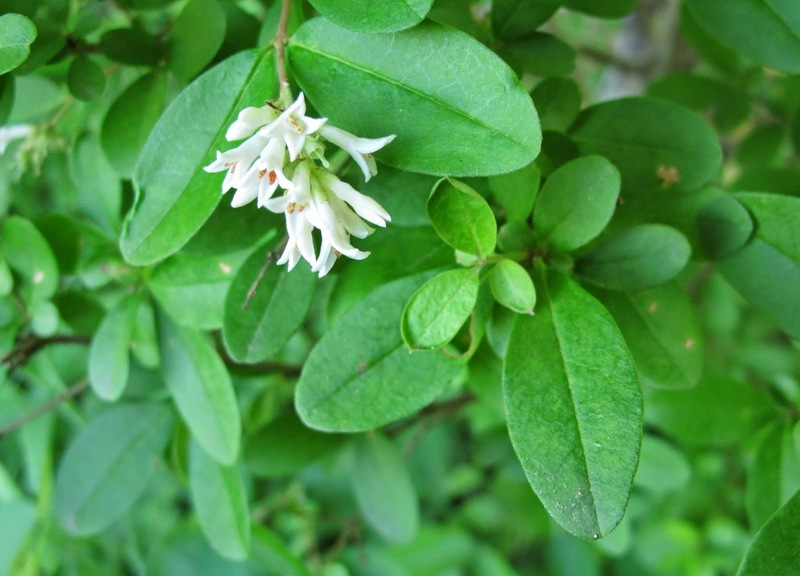 Privet is easily shaped by pruning and is commonly planted in rows to create a formal hedge. My grandfather once had hundreds of feet of privet hedge surrounding his yard and when he could no longer handle the job, I was drafted to be his hedge trimming assistant. Being the assistant meant that I wielded the huge double edged electric trimmers while Grandpa sat in the shade calling out directions. The first thing he told me was to keep the trimmers away from the cord, but the three 100 foot sections of extension cord bringing power to the trimmers were already weighted by about 25 pounds of multi-colored electrical tape protecting splices where the cord had previously been severed. In fact, he cut through the cord while showing me the proper way to handle the trimmers. After all of the agonizing hours I spent trimming that hedge, you would have thought I’d recognize that leaf right off. Of course, properly trimmed hedges never get the chance to flower. I doubt that even smiley faced flowers would have made the trimming job any easier. It wasn’t unhappy childhood memories that made me cut down the Privet. The best time to eliminate an invasive species is when the first one shows up on the property. 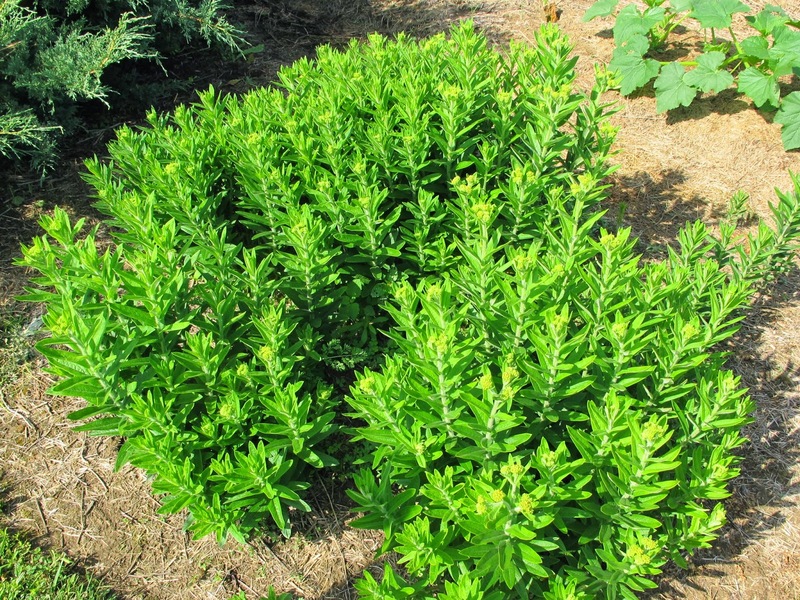 Minutes after being added to the Blue Jay Barrens plant list, the shrub was cut and sprayed. 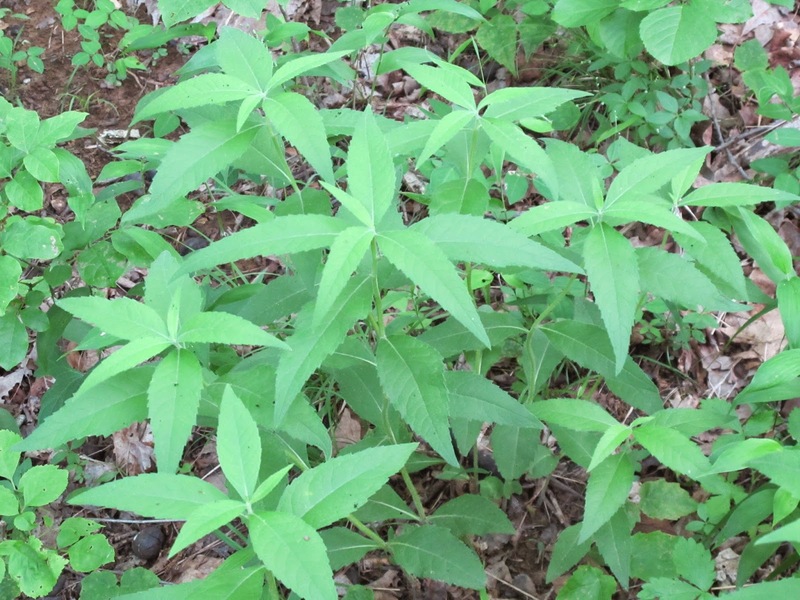 The name stays on the list, but there is a notation that the plant is now considered to be extirpated from the property. I’m always happy to add another species to the plant list and I’m thrilled to eliminate an invasive species, so discovery of this plant provided multiple pleasures. I was trying to do a growth ring count to determine approximately how long ago this specimen arrived here. 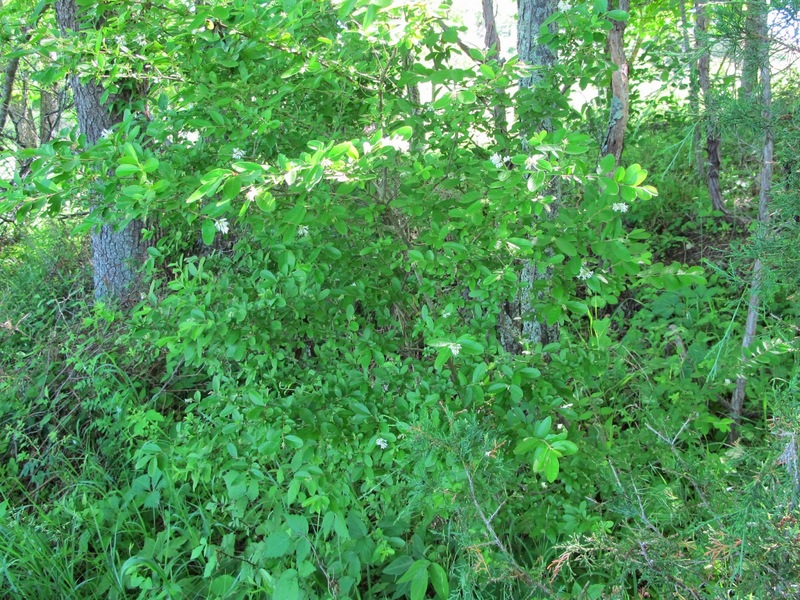 As is sometimes the case with shrubs, multiple rings can appear that are not related to annual growth cycles. My count was inconclusive. My estimate places the arrival of the original seed to be somewhere between several and many years ago. I hope you don’t think that I’m one of those people who would take the opportunity to use a photo like this as the last of a sequence and caption it with a tired old pun like THE END. You’ll not see that here. My list of plant species found naturally growing at Blue Jay Barrens continues to expand. The latest addition to the list, Number 535, is Hairy Wingstem, Verbesina helianthoides, a native species uncommon in Ohio. 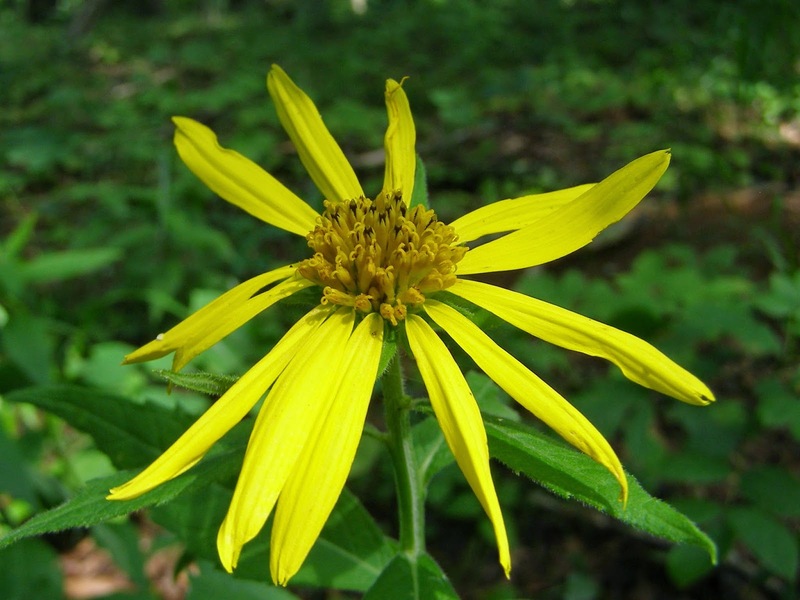 This brings the number of native species up to 440 which is about 25 percent of all native plant species found in the state of Ohio. That's not bad for a property of just over 100 acres in size. 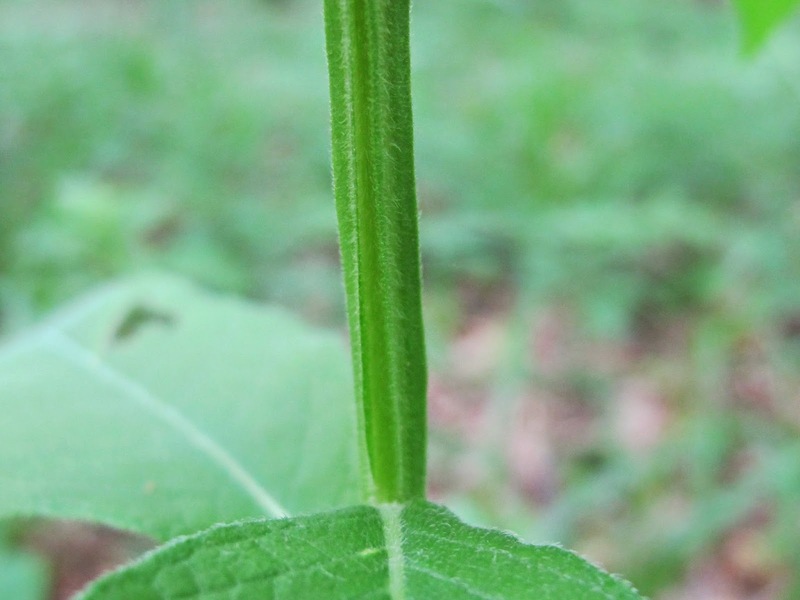 I’ve seen Hairy Wingstem at other sites in Ohio and it was growing in conditions identical to what is shown here. 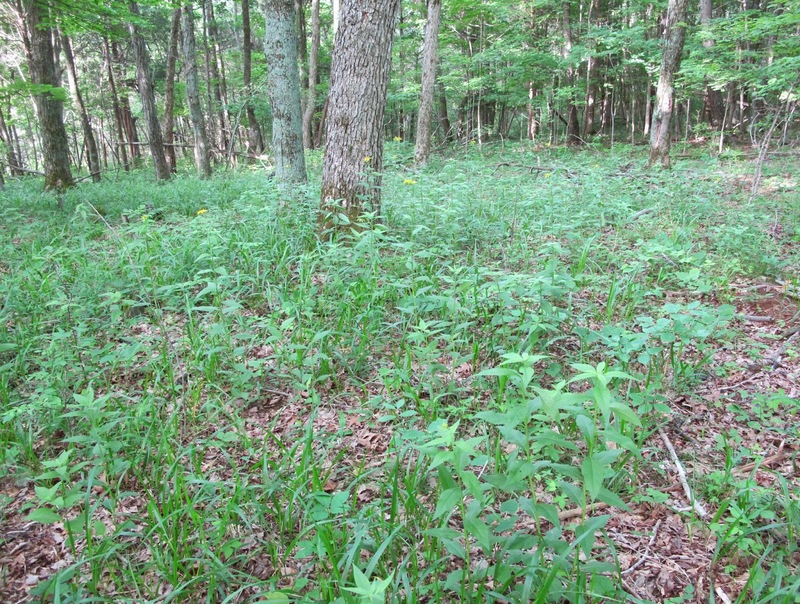 Open woodlands on dry soils seems to be its preferred habitat. I’ve long believed that the plant should be found on this property. It has just taken me this long to find it. There are several possible reasons why I failed to notice the plant before now. One is the fact that the related species Wingstem, Verbesina alternifolia, is common over the entire property and shaded individuals of that species are more diminutive and come close to resembling the Hairy species. 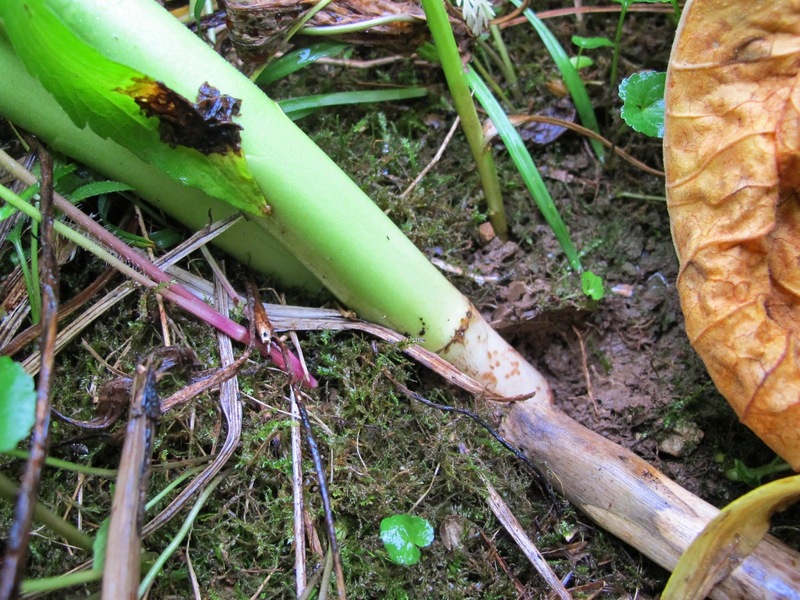 A cursory glance at this winged stem might cause a person to call it a Wingstem, especially since stunted plants of the standard Wingstem are within 100 feet in all directions of this site. Close examination of the Hairy Wingstem does confirm that it is hairier than its relative. 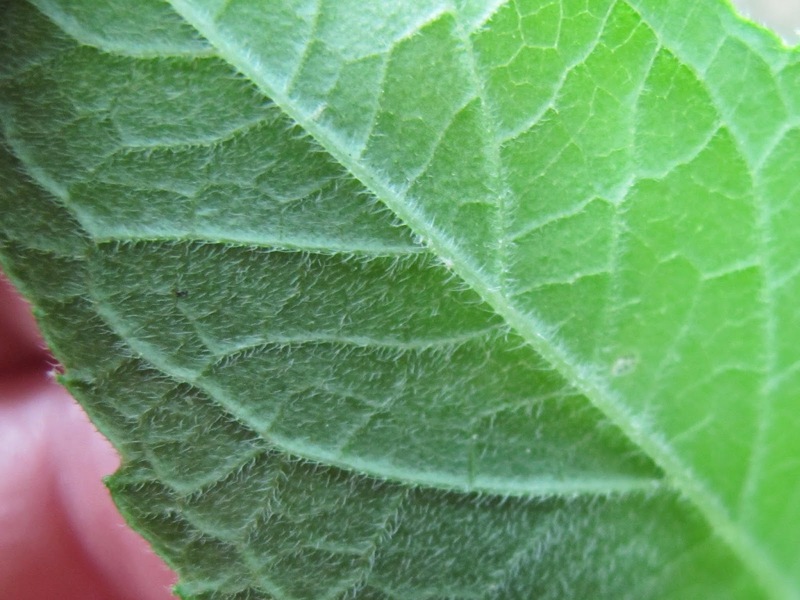 Leaves, besides being a slightly different shape, also have more hair. The most noticeable difference is the feel of the leaf as you rub it between thumb and finger. Hairy Wingstem is soft and pliable, while Wingstem is rough and stiff. Hairy Wingstem flowers have more petals and fewer flower heads than the standard Wingstem species. 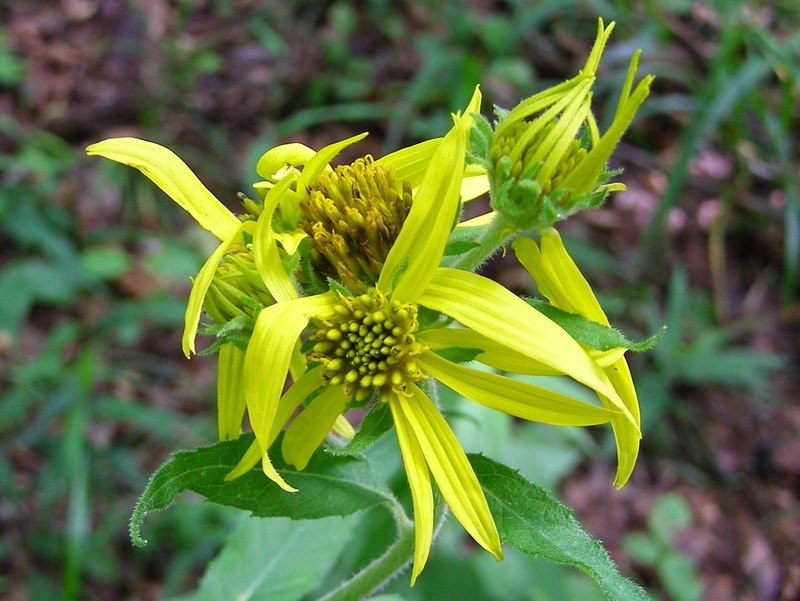 The heads resemble several other species of yellow woodland sunflowers, so are sometimes overlooked on that account. 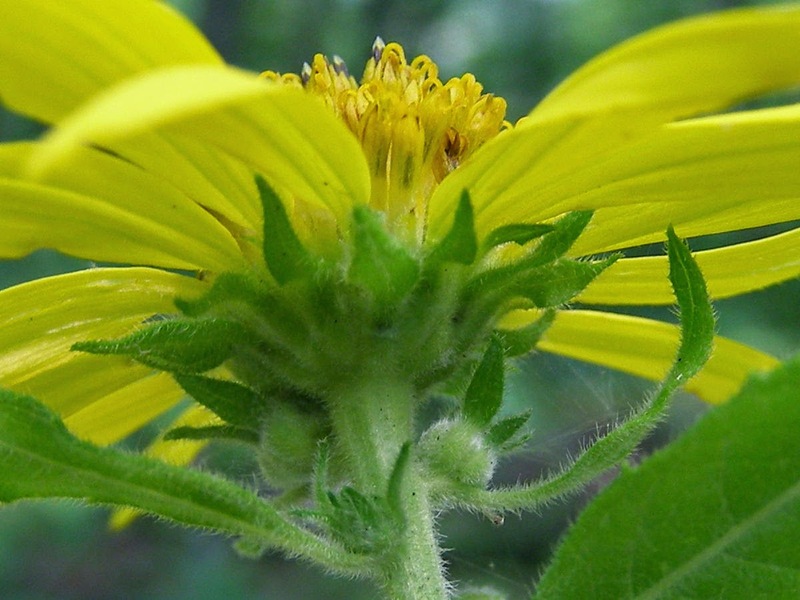 Flower heads are attached to short stalks and crowd together at the top of the plant. 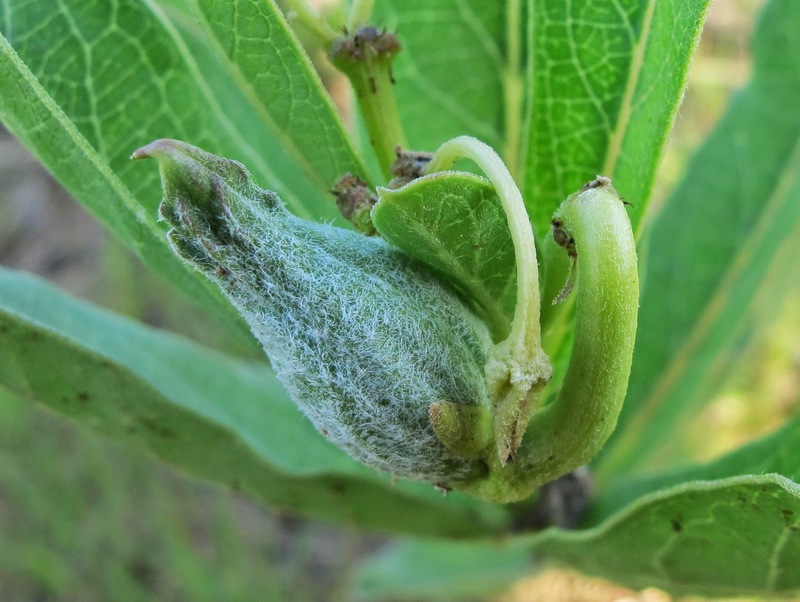 It gives the impression that the plant has suffered some injury or disease that resulted in an unsightly plant deformity. There are plenty of young plants coming on. Tree loss has caused the canopy in this section of the woods to open more during the last 10 years. I’m wondering if the plants have been stunted by lack of light and just in the last few years have begun to grow to their full potential. I guess the reason for my inability to find the plants until now is not as important as the fact that the plants are here. I counted over 100 Hairy Wingstem plants and at least 30 of those are currently flowering. It’ll be fun to watch the changes in this patch over the next few years. When managing land for biological systems, there are many factors over which you have no control. Some of these have an enormous influence over your success. A prime example is the weather. Yesterday evening, Blue Jay Barrens was visited by a thunderstorm exhibiting high wind, heavy rain and hail. Physical evidence of the storm’s passing was abundant. 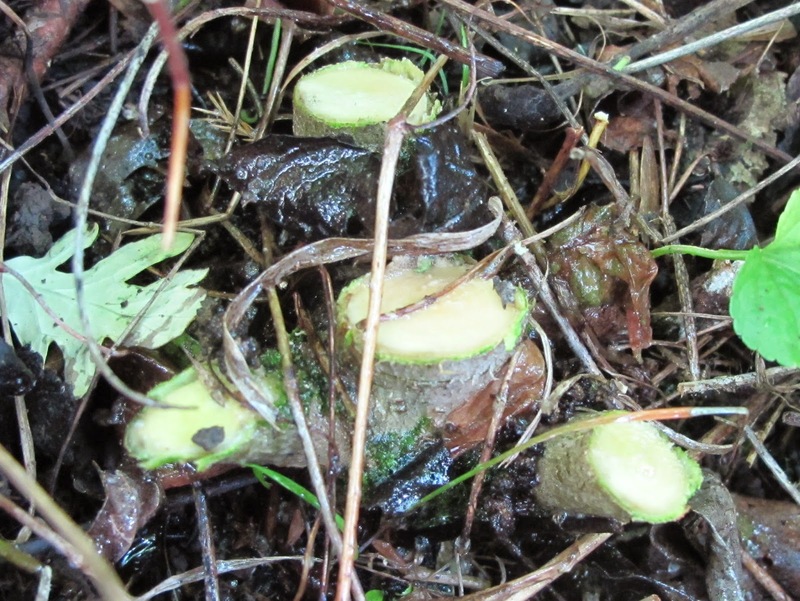 Downed tree limbs, broken plant stalks and flooding were found everywhere. 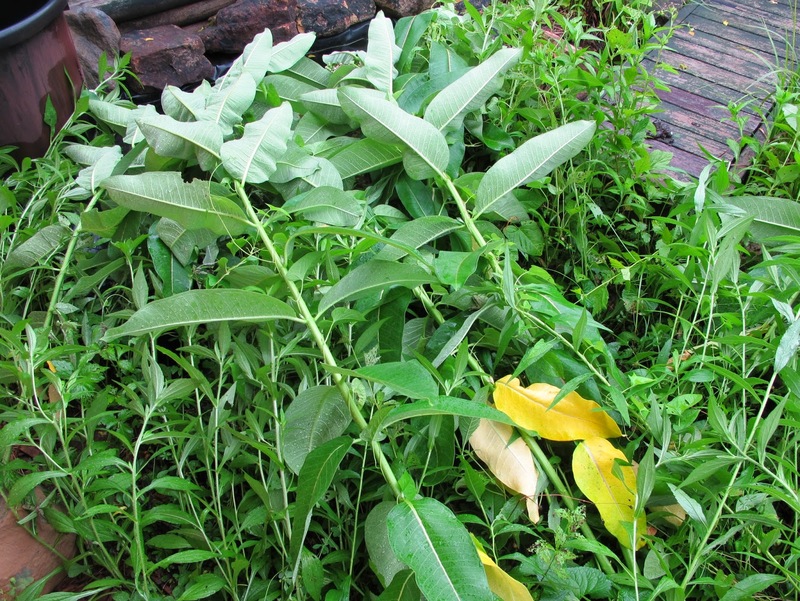 What I observed from the relative safety of the front porch, was the toppling of the milkweeds. 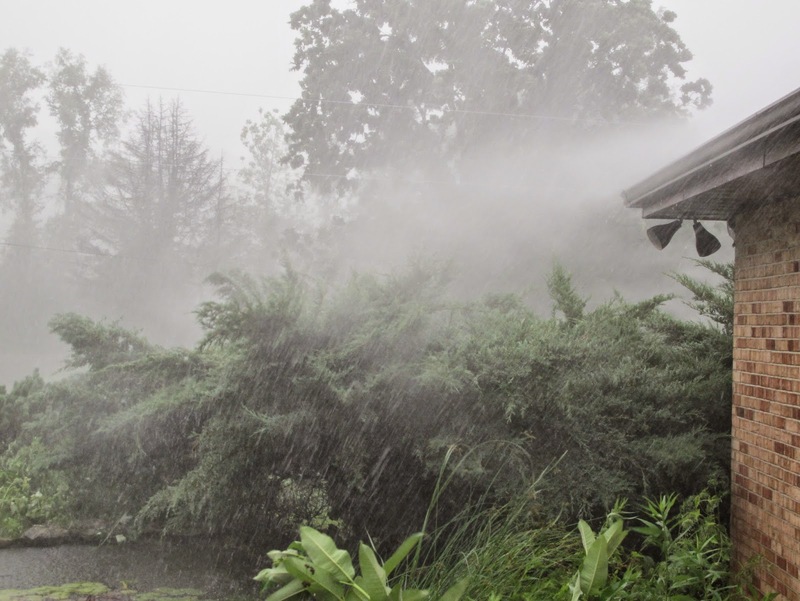 It all began with the simultaneous arrival of howling straight line winds and a heavy downpour of rain that sent an impressive wave of water spray breaking over the eves. Wind and rain subsided slightly as a flurry of hailstones joined the mix. 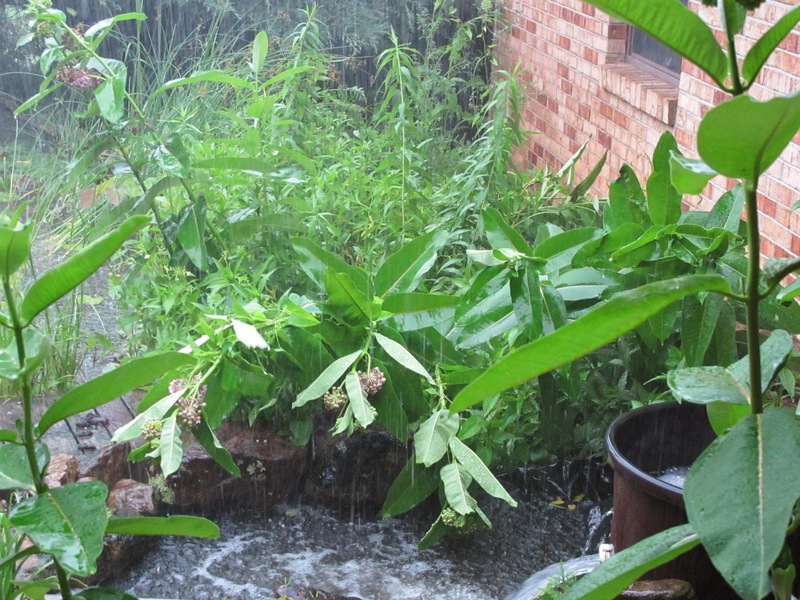 Milkweeds near the water garden, heavy with rain and battered by hail, began to give way before the wind. 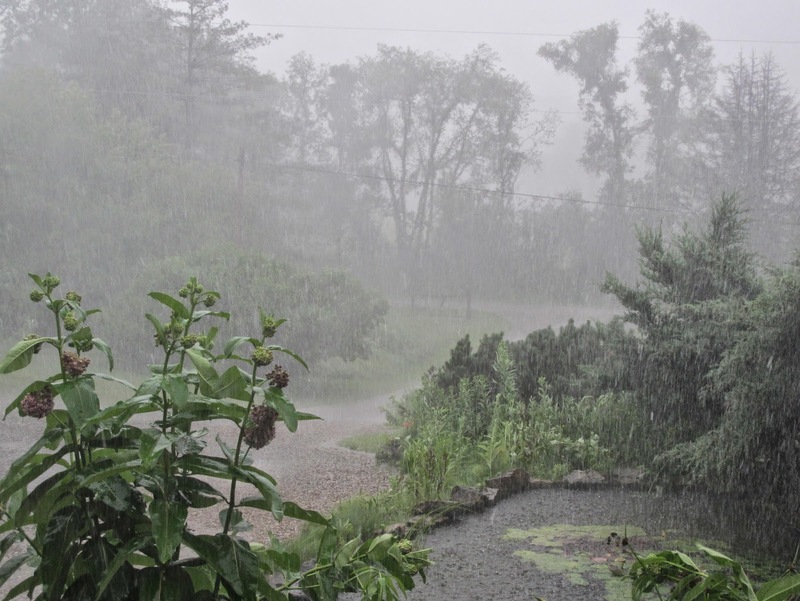 As the hail thinned, rain increased in intensity. 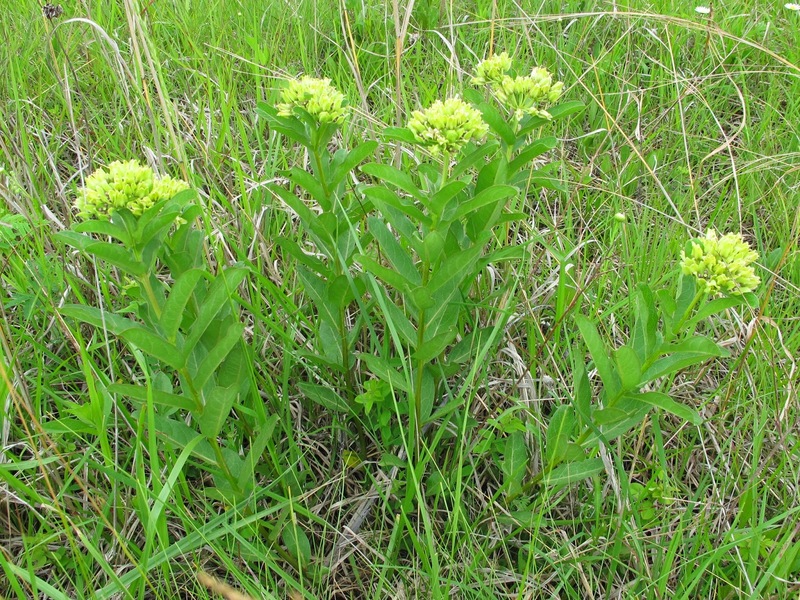 Several milkweeds have remained upright. At this point, I was thinking the worst of the storm had passed. I was wrong. 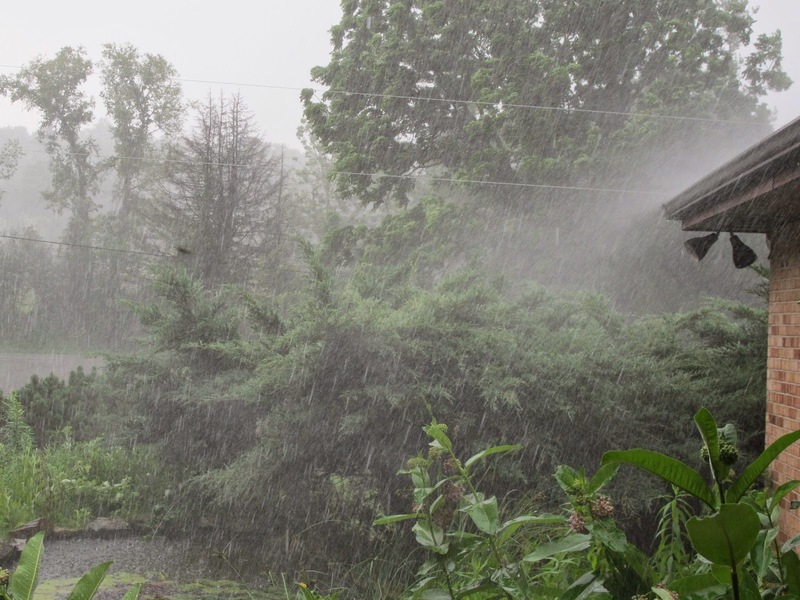 Heavy rain continued, hail resumed and the wind returned with a roar loud enough to send me running to the other side of the house to see if anything dangerous was headed in my direction. When I returned to the porch 20 seconds later, the wind was driving straight down and pushing spray into the porch and onto the ceiling. We went from hurricane like conditions to a light summer shower in just a few seconds. I watched the back end of the storm thrash the woods on the hill across the road and then it was gone. Amazingly, some milkweeds are still standing. 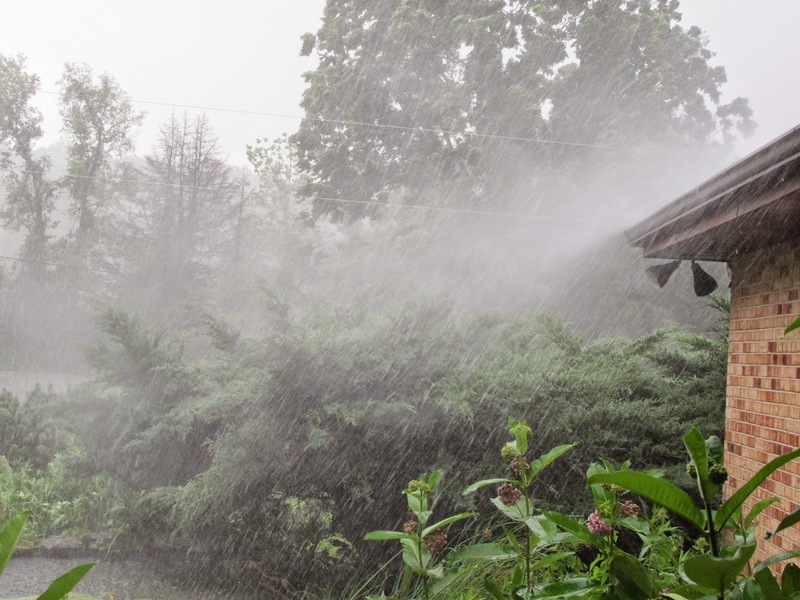 Violent summer weather may be uncontrollable, but that doesn’t mean it’s unpredictable or unexpected. The milkweeds around the water garden, as well as many out in the fields, get flattened every year. Younger specimens can almost bring themselves back upright after a storm, while those at this stage will gradually reorient the top of the plant so the flowers are held up for insect visitors. 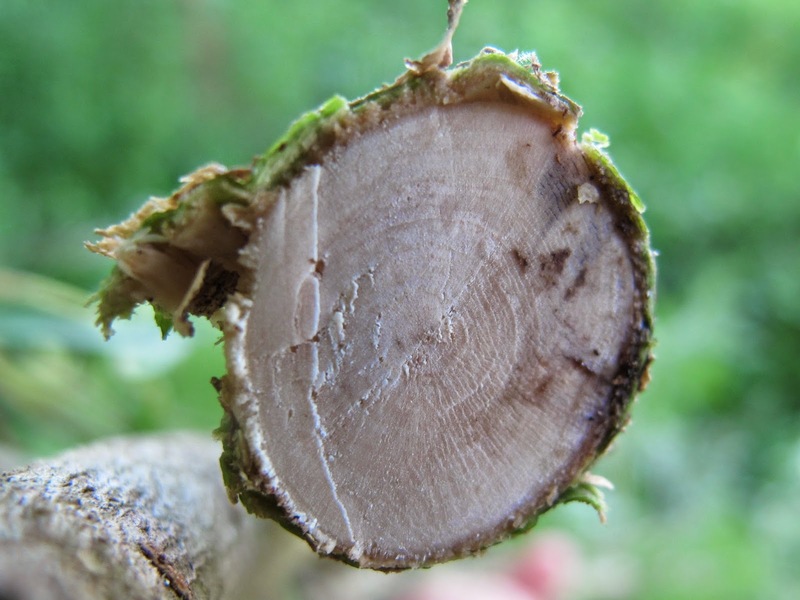 Their susceptibility to storm damage does not diminish their importance as a valuable part of the natural ecosystem. 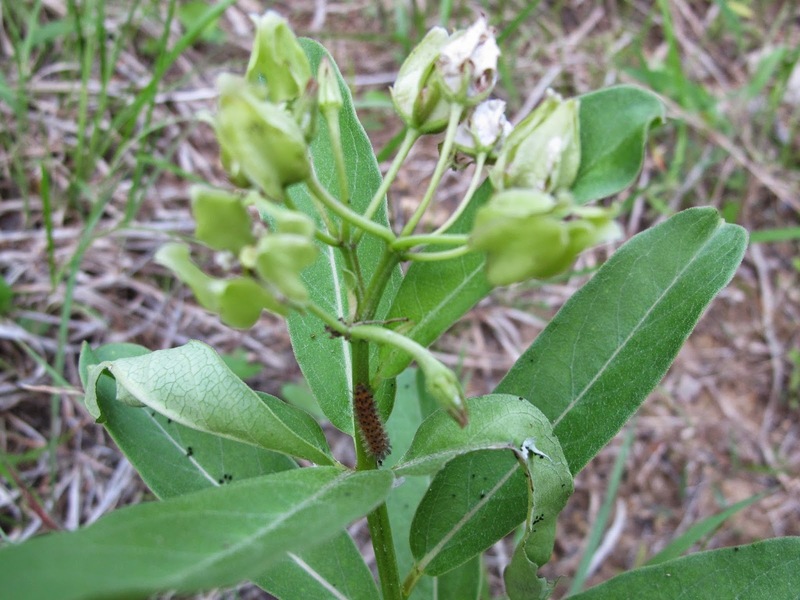 The milkweed stalks have not broken at the base and can be returned to an upright position if stakes are provided for support. Since these are growing right outside the front door, I’ll do my best to return them to their proper orientation. My wife claims that they remind her of Triffids lurking in wait near the porch and I don’t want them to appear as though they are reaching out to her. The leaves will carry their hail damage for the rest of the season. The milkweeds colonized the water garden flower beds on their own several years ago. I left them alone to grow and increase their numbers because this patch seemed to be a preferred egg laying site of the Monarch butterfly. Monarch caterpillars have always been present on these plants by this date in past years and evidence of their feeding should be present on the leaves right along with the hail damage. This year I have yet to see my first Monarch. Plenty of other insects utilize the milkweed, but it just doesn’t seem right without the Monarchs. 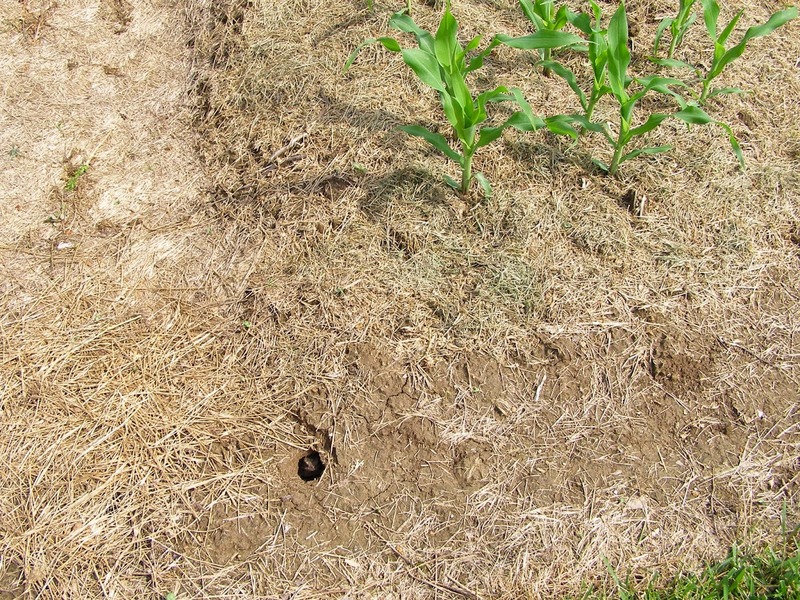 Eastern Moles tunneled extensively through my vegetable garden during this past winter. They are no longer active and the tunnels they left behind periodically collapse to provide an entrance to the underground labyrinth. A fresh opening at the end of one of my garden beds showed signs of movement inside, so I went to investigate. The color matched the surrounding soil, but this was no lump of dirt. 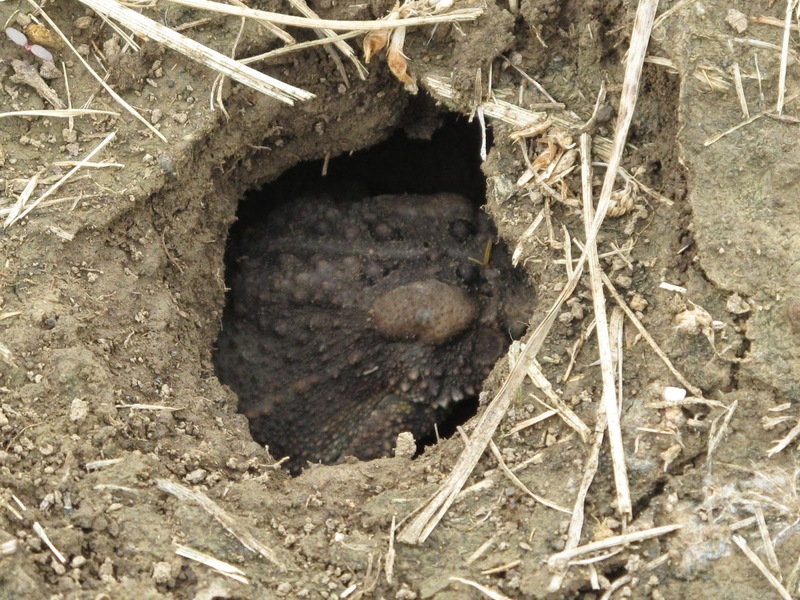 An American Toad was using the mole tunnel as a daytime retreat. 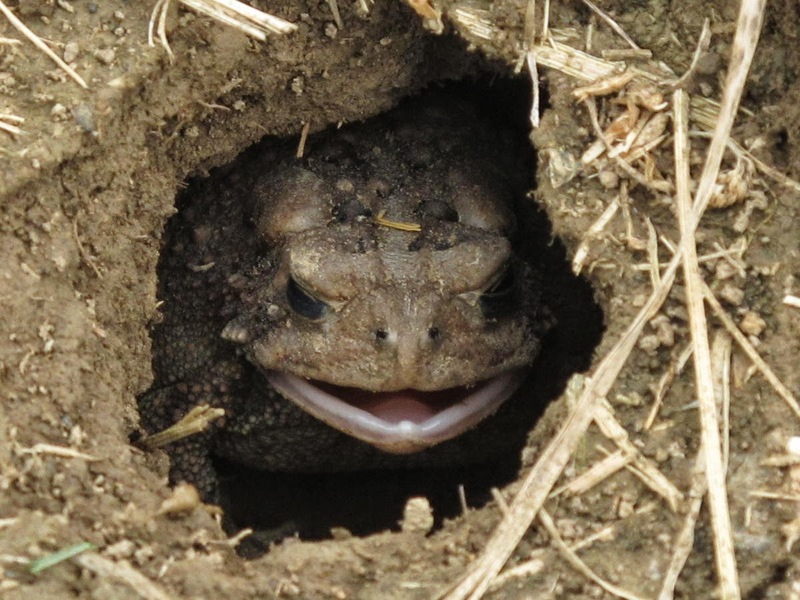 As I looked in at the toad, it turned and peered back at me. Toads have always been a favorite of mine. When I was nine years old, my best friend through the summer was a toad. He lived in a shaded pen in the flower bed and I took him out every day to hunt for food. As I turned stones or dug through the soil, he would climb over my fingers in an effort to be right up front when a tasty morsel was unearthed. When school began in the fall, I just removed the walls of his pen and left him to forage on his own. A toad will eat just about any slow moving creature small enough to fit in its mouth. 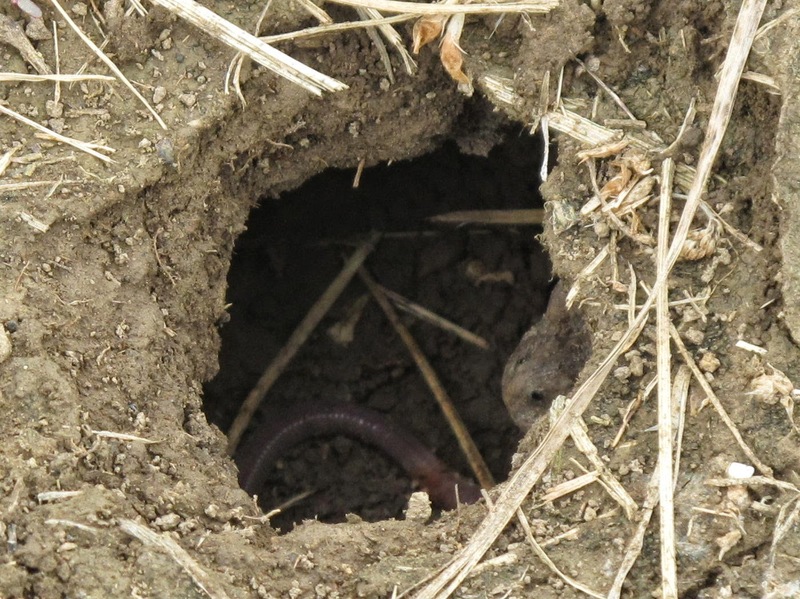 I dropped a couple of earthworms down the hole for this guy. 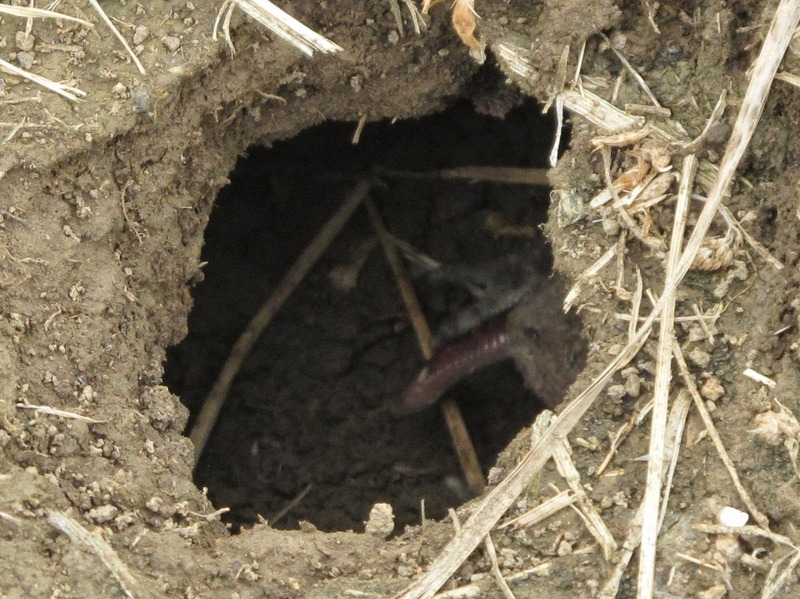 It was just too difficult to get a good shot of the toad eating while it was down in the mole tunnel. The toad ate every worm I sent its way, but the best view I got was of the toad with a worm end sticking from its mouth. 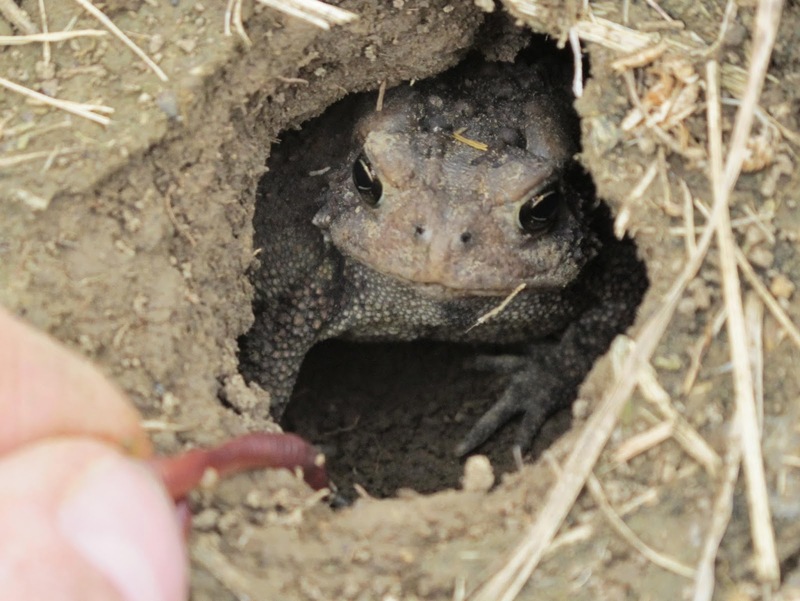 I tried holding the worm at the tunnel entrance and the toad obligingly came out to accept the offering. The toad was just too fast for me. The worm was taken and swallowed before my camera could react. 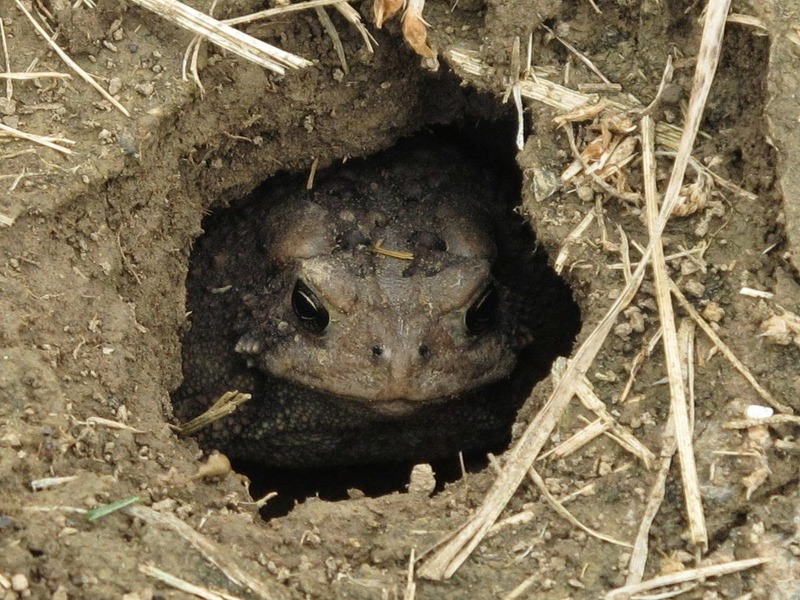 I think the toad got full, because after a few worms, it crawled on down the tunnel and disappeared. The exciting thing about this toad discovery is the fact that the toad was within 120 feet of my toad pool. 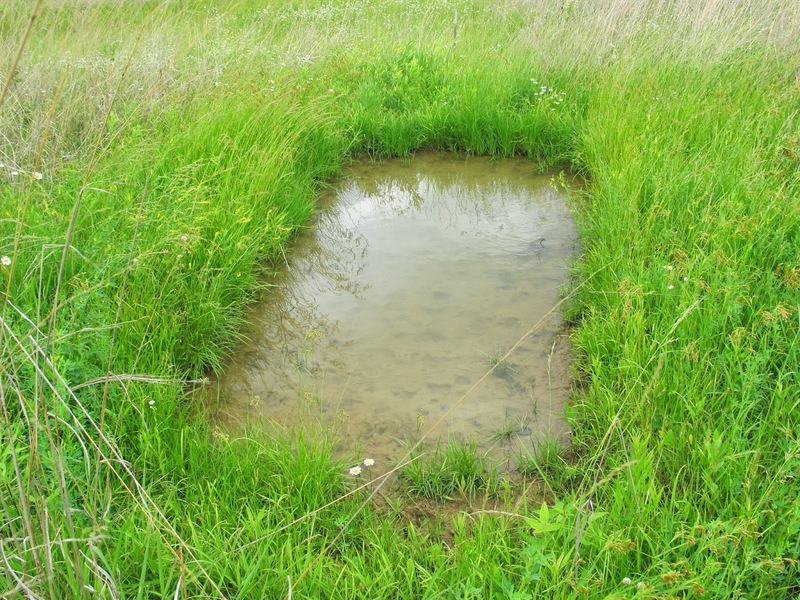 Built specifically for use by breeding toads, the toad pool has yet to receive its first toad egg. To be fair, the pool has only been in existence for two breeding seasons. With toad numbers on the decline at Blue Jay Barrens, I am hopeful that the addition of suitable breeding sites will reverse that trend and result in toad encounters once again being a common occurrence. 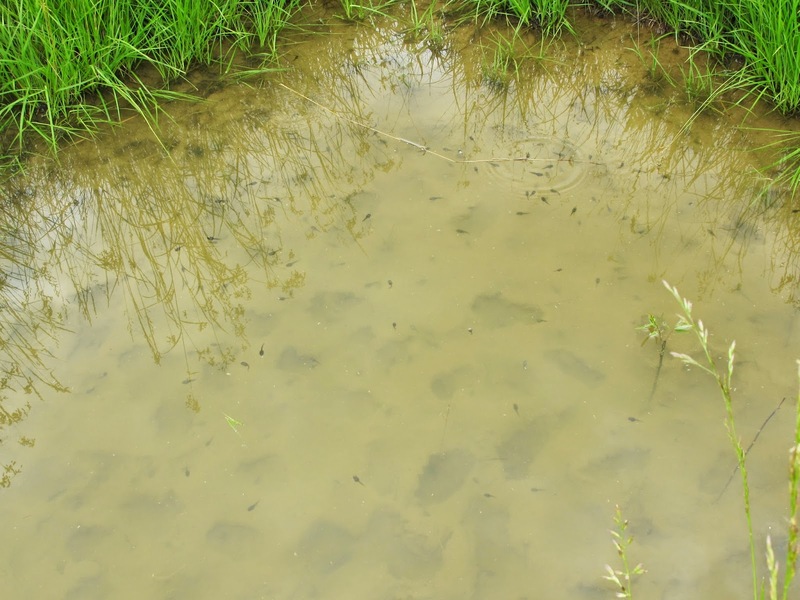 Wood Frogs have demonstrated that the toad pool provides adequate food and water to satisfy the needs of tadpoles through their development to small frogs. 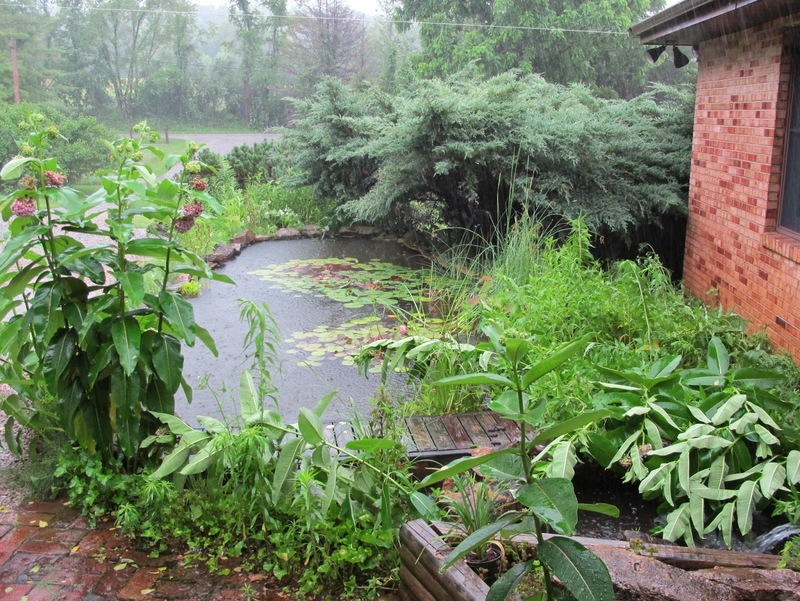 Maybe it will be next year that the toads prove that the toad pool idea was properly conceived and executed. The pool has attracted a wide variety of wildlife, but until the toads arrive, I’ll have to consider the project to be a failure. The blooms of my favorite milkweed are quickly fading from the prairie landscape. 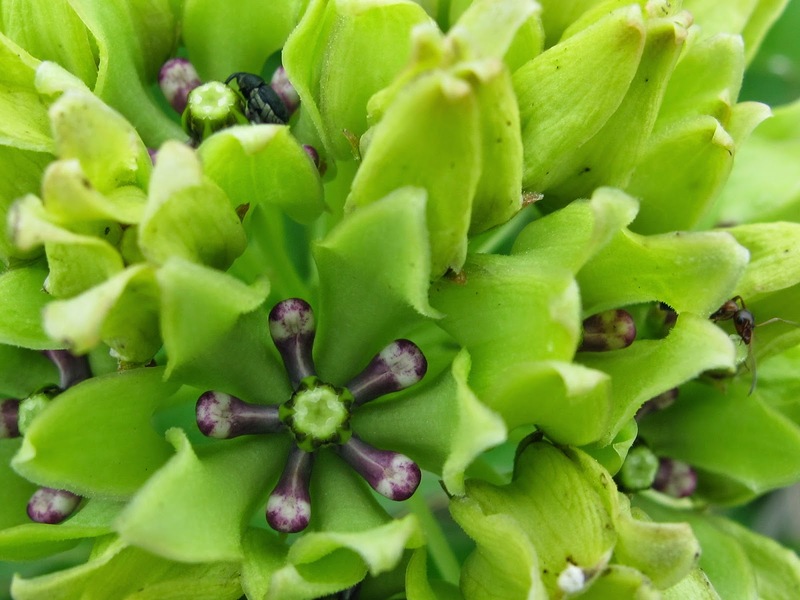 Spider Milkweed, Asclepias viridis, is an early season bloomer that generally ends its flowering period before the first day of summer. Not only does this plant produce an amazingly interesting flower, it also is a focus of activity for a variety of animal species. 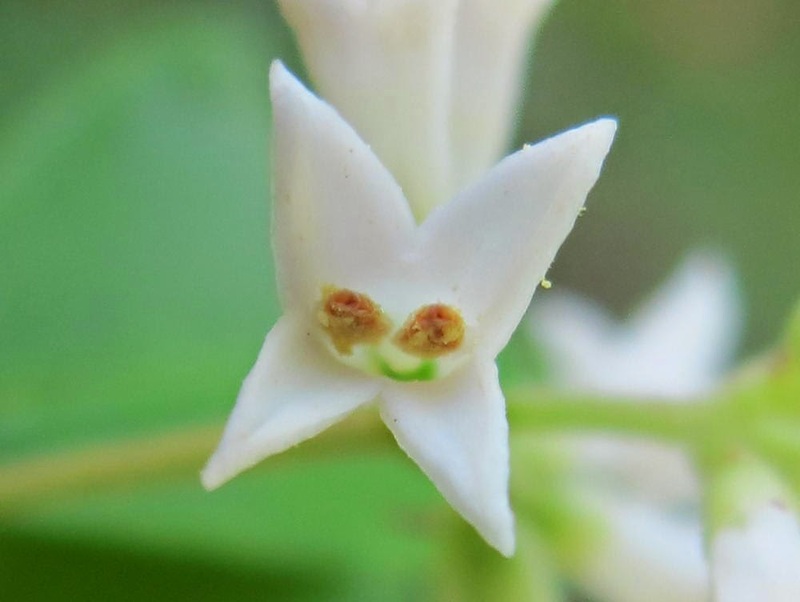 It’s impossible to look closely at these flowers without some small creature looking back. The pale green flowers are impossible to miss. If Spider Milkweed is in the mix, it will certainly be noticed. Having a multitude of insect visitors means a quick pollination. Seed pods soon replace flowers. By mid summer, seeds will fly and the plant will begin to enter its dormancy. Among its many insect visitors, Spider Milkweed supports the larvae of the state endangered Unexpected Tiger Moth, Cycnia inopinatus. 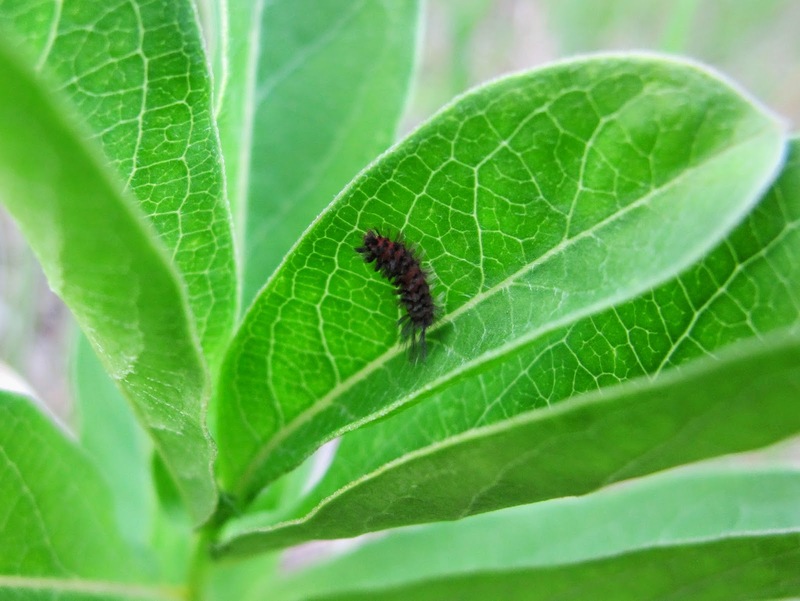 The orange bodied larvae are easy to see against the green of the plant. The Unexpected Tiger Moth is double brooded in southern Ohio and is generally associated with Butterfly Weed, Asclepias tuberosa. The body color of the larva tends to blend with the orange flowers of the Butterfly Weed and provide some protective camouflage. That strategy doesn’t work on the Spider Milkweed. 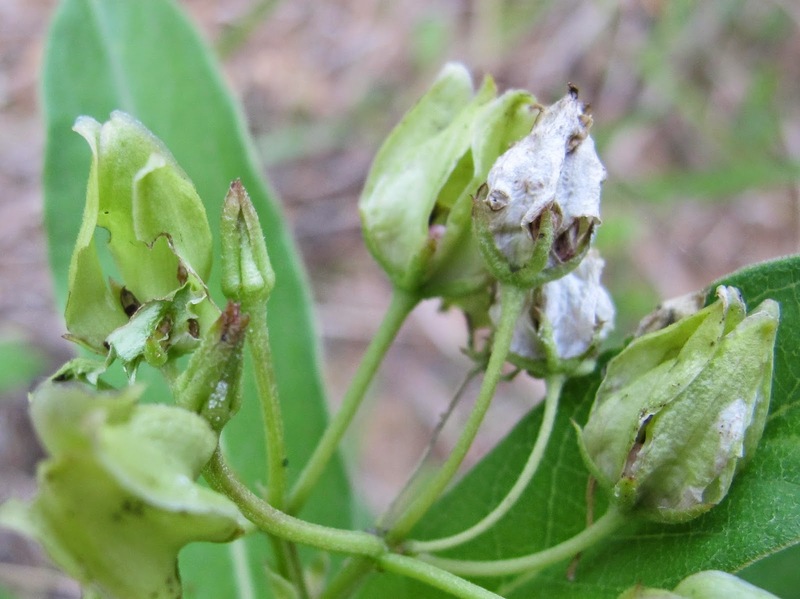 Many insect species that feed on milkweed develop toxicity by consuming and processing the toxic compounds in the plant. Orange coloration is a common trait shared by these insects and indicates to predators that the insect is best left alone. 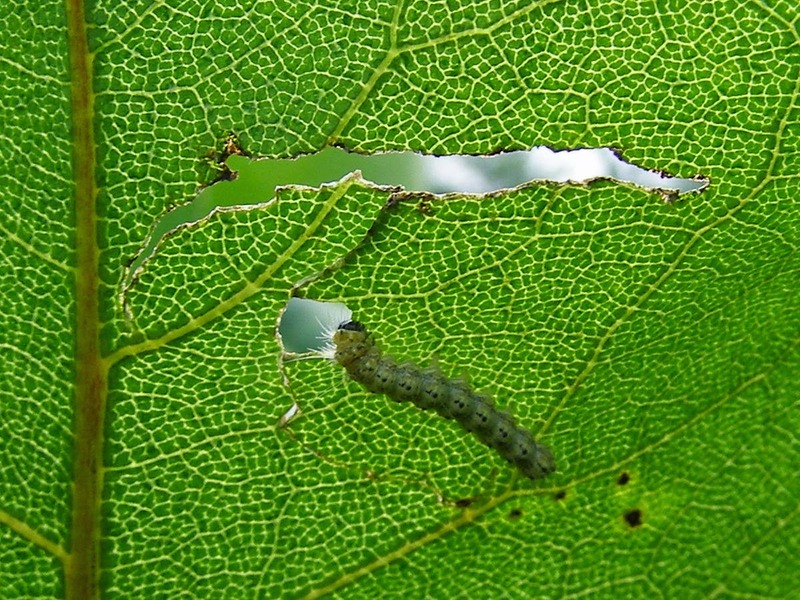 That may help this colorful larva to avoid predation. I assume that the adult moth lays its eggs on the flower buds of the Spider Milkweed. Signs of feeding on the flowers is the first clue that Unexpected Tiger Moth larvae are on the plant. 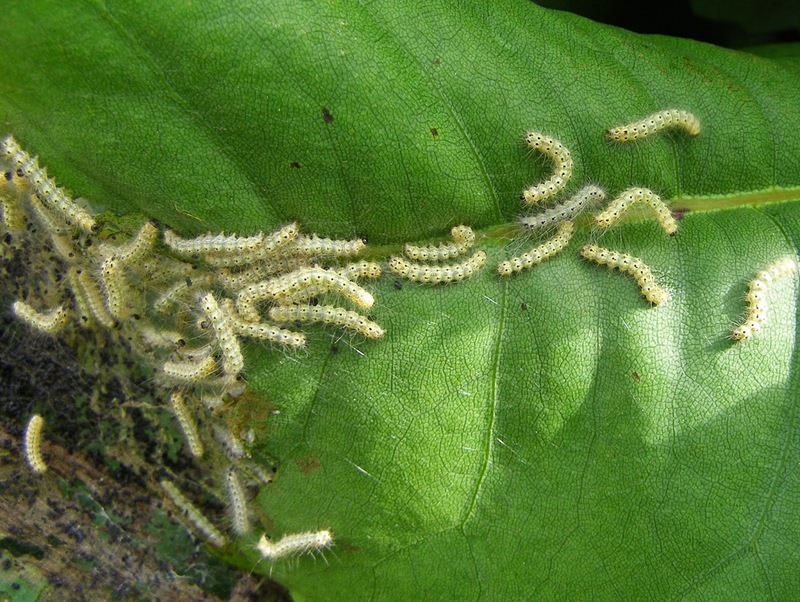 As the larvae grow, they move on to feed on the leaves. During the last few years, I have noticed that the first brood of the Unexpected Tiger Moth utilizes Spider Milkweed and the second brood uses Butterfly Weed. That means it is necessary to have an adequate population of both milkweed species in order to have a healthy population of moths. Currently at Blue Jay Barrens, Butterfly Weed is much more common than Spider Milkweed and the two species grow in different areas. 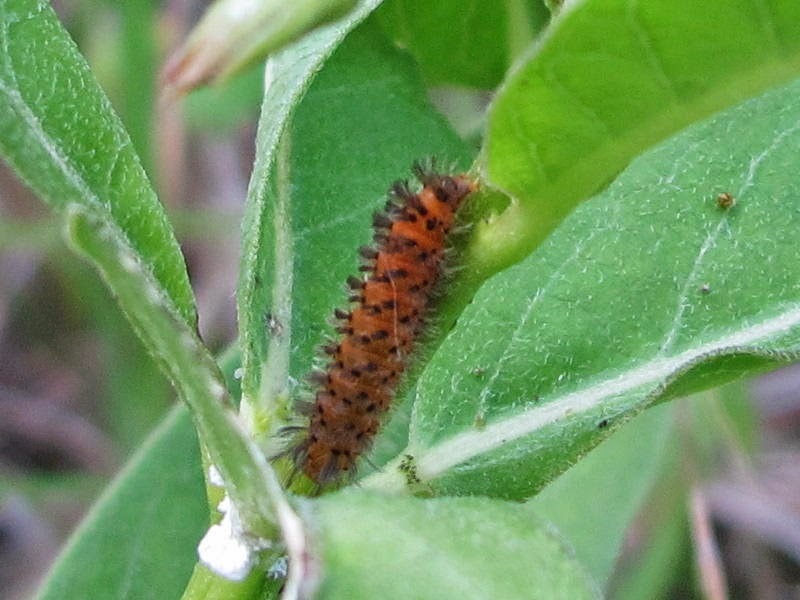 I am now attempting to establish Spider Milkweed populations in closer proximity to the Butterfly Weed to see if this increases the numbers of Unexpected Tiger Moths. Part of that activity will take place in my garden where this clump of Butterfly Weed has a history of hosting second brood Unexpected Tiger Moths. It takes two or three years for a Spider Milkweed plant to reach flowering stage, so it will be a while before I know if my plan is successful. I’m hopeful that I will eventually see this effort benefit the moth. Even if it doesn’t, it will be nice to have more Spider Milkweeds growing in the fields.